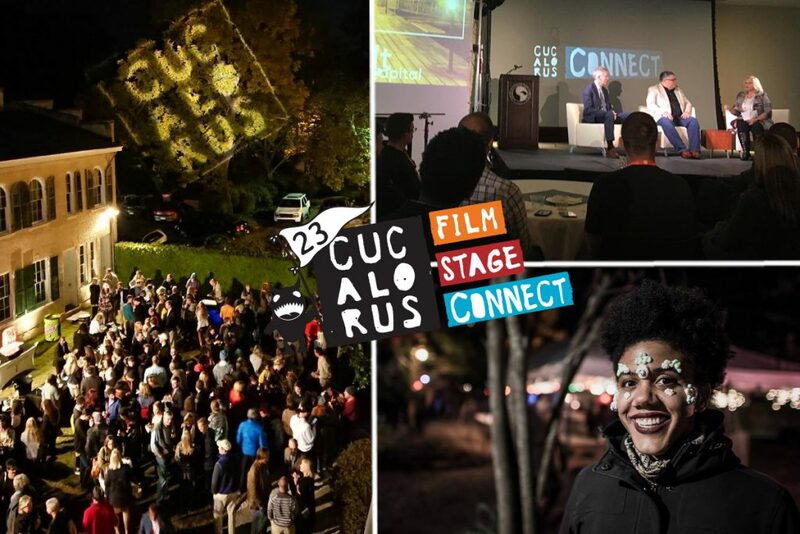 The Cucalorus Festival wrapped its annual five-day celebration last Sunday in downtown Wilmington, North Carolina with record-breaking accumulated attendance of 19,069 spread out over more than 200 events. The annual celebration was reborn this year with a renewed, more intentional focus on exploring the intersections between creativity and technology. The result was a multi-media showcase of emerging trends in culture and economics touching on issues ranging from gang violence to American excess. Resting squarely on the shoulders of former Steve Jobs exec Tom Looney and his extensive, international network of friends and speakers, the Cucalorus Connect Conference delivered on early promises to shift the conversation about economic development in the region. Attendance at the Connect Conference doubled, led by George Taylor’s frank and inspiring talk with Kevin Maurer about Tru Colors Brewing, his latest startup – a brewery run by active gang members. Organized by entrepreneur Alisha Thomas, a local chapter of the Ladies Get Paid network was launched by founder Claire Wasserman on the conference’s opening night. Wasserman’s breakout “If it makes you uncomfortable, we should probably talk about it” was the conference’s most attended breakout session followed by Wilson Raj’s talk on data and digital customer experiences. The Cucalorus Film lineup was not shy about diving into deep social and political waters either, as Onur Tukel’s “The Misogynists” packed Thalian Hall on Thursday evening. The film, hot off a controversial appearance on the west coast, was followed by a wild QnA featuring Sophie Traub and Josephine Decker dressed as Tukel. The highlight of the doc lineup was Ricky Kelly’s “Black Beach/White Beach,” which drew so many people to Jengo’s Playhouse for its world premiere that a second screening was added. Gravitas Ventures, one of many distributors attending the festival looking for new content, is currently in negotiation with Kelly about a distribution deal. Shorts ruled the box office though, with more than half of all the shorts blocks going to rush. The festival screened a total of 301 films, including 65 international, 35 narrative features, 18 documentary features, 194 short films, 41 music videos, and 5 projects from our Works-in Progress Lab. Keeping the ongoing promise announced during last year’s festival, half of all films presented at the festival were directed by women.